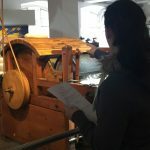 Wenn im Lehrplan „Industrielle Revolution“ steht, mag das für den einen oder die andere langweilig klingen. 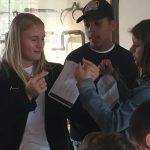 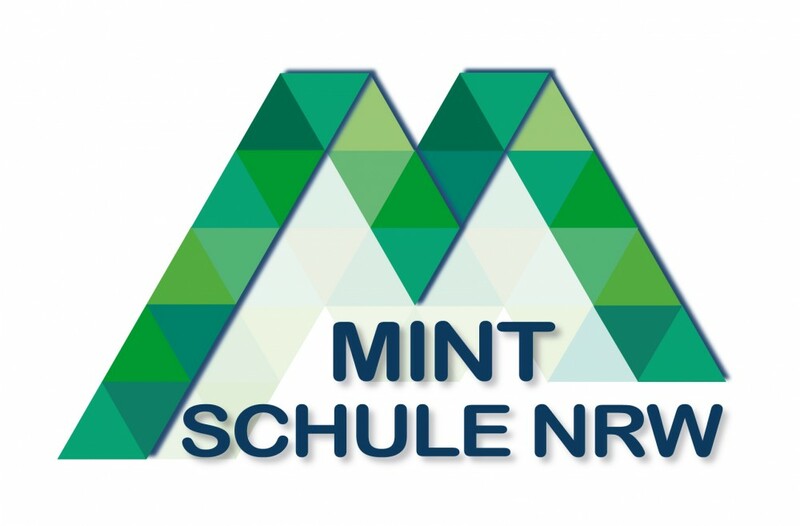 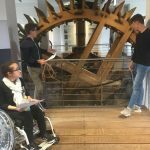 Für die Schüler*innen der bilingualen Neigungsklasse 8.4 ist dieses Thema mit einem besonderen Highlight verbunden: mit einem History Slam im Industriemuseum Ratingen. 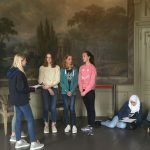 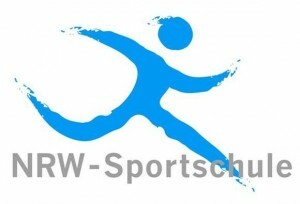 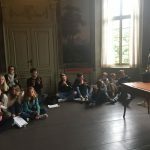 Die Schüler*innen hatten verschiedene Themen zur Auswahl und konnten selbst die Art der Präsentation ihrer Gruppenergebnisse wählen. 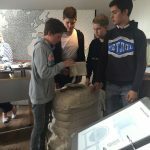  The material of which dreams are made: The students explained the triangular trade with special regards to the cotton business. 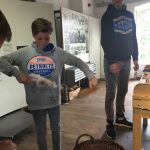 They beat the cotton on the betting table and showed how the cotton is loosened further and combed. 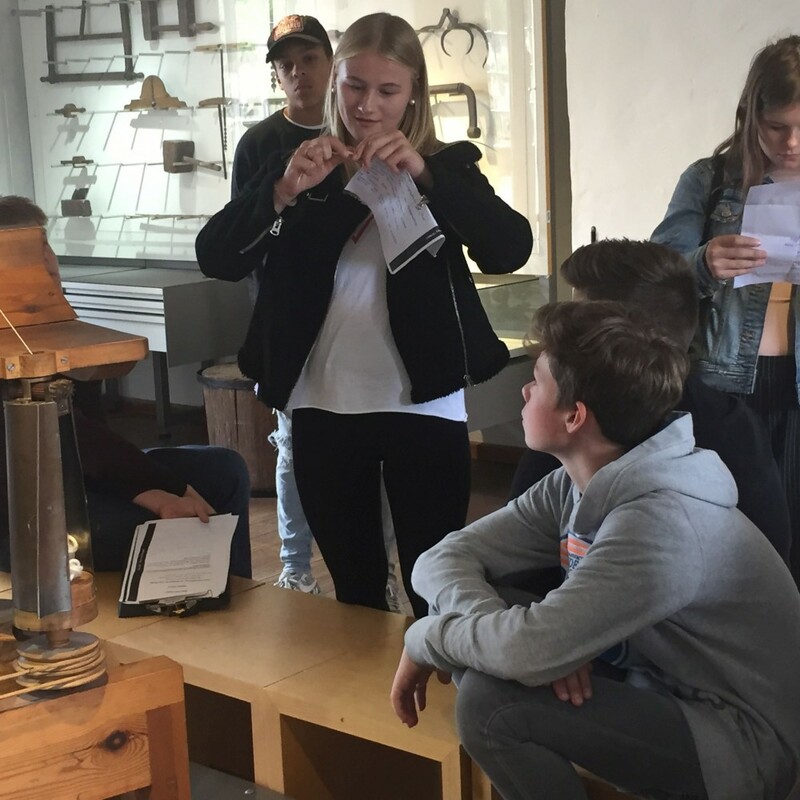  Mechanization of the revolutionary textile industry: The students talked about the technology and the working methods by describing the carding machines and lantern benches, the preliminary and fine spinning. 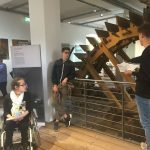  Energy and power transmission: The students reported on the undershot waterwheel and how the water beat the paddle and started to move the water wheel. 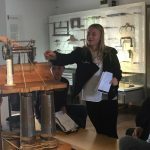 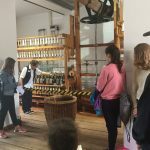  Factory owner Brügelmann and his water frames: Students informed about Johann Gottfried Brüggelmann, merchant and founder of the textile mill Ratingen Cromford, his pioneering spirit and the industrial espionage. 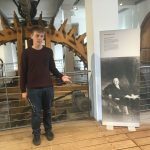 Richard Arkwright invented the waterframe in England. 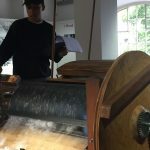 But although the English government protected the secret of the machine Johann Brüggelmann succeeded in spying on Arkwright and stole the secret of the machine and founded the Cromford tectile factory in Ratingen, the oldest factory on the European mainland in 1783. 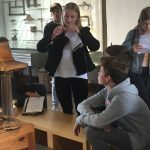  The social question: In a role play the students discussed pauperism, the extreme poverty of the factory workers during the Industrial Revolution, their terrible living quarters, no space for families, no rights for workers low wages, diseases and hard punishment. 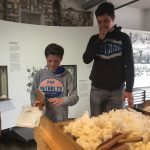  Child labour: Another role play informed about the situation of the working children, their kind of work, no school education, long working hours, strict rules, accidents.